Like all Mom's I strive to feed my family as healthily as I can. To me that means whole foods that are as unprocessed as possible. In other words fresh foods. Mostly meat, fruits and vegetables. This can be a little tricky when it comes to having snacks handy for on the go but I have come up with a few good solutions that I thought I would share. You can usually get these in little cans with a pop top making them very convenient for on the go. I honestly don't get the canned vegetables very often anymore, they usually get mostly thrown out, my son it not a big fan. But canned fruits are a favorite. I look for fruit canned in their own juices instead of heavy syrup. Our favorites are fruit cocktail, pineapple, mandarin oranges, pears and peaches. Olives are also a favorite and a good source of healthy fats and a yummy snack that fits on your finger! Not sure if that counts as a vegetable or fruit or what but they are great. These are just too perfect for a little easy on the go protein. They are just so darn good for you too! Since you eat the entire fish you get all the health benefits of all the bones (calcium and minerals!) and organs (very high in nutrition!). They are also a good source of omega 3's. They are a very sustainable food source and since they are so small and low on the food chain mercury is not really a concern. I recently started always making sure I have a can of these in my bag. My son and I will eat these on crackers or nori (see below) or sometimes all by itself. One of the benefits of exploring different eating philosophy's is that you come across things like flax crackers. This is a raw vegan staple, but if you are not a raw vegan or know a raw vegan you have probably never heard of such a simple, healthy and awesome recipe. Just do a google search for flax cracker recipe and you will find a million of them out there, they are that popular in the raw vegan community. I'm not a big fan of grains as a food personally so we don't do goldfish crackers or gram crackers or even multi grain crackers for that matter. But I do sometimes make crackers at home with nothing more than ground flax seeds (omega 3's!) and blended vegetables. Simply mix about 2 cups ground flax seeds with an equal amount of well blended vegetables (or fruit if you like), maybe a little water if needed to help form into a "dough" and dehydrate like this, or even just bake them at about 350 for 10-15 min. Some of our favorites are carrots and fresh ginger and "salsa" crackers with tomatoes, garlic, cilantro and serrano chili's. I get these seaweed sushi sheets at the Asian market in bulk for snacks and lunches. Sometimes we eat them plane but most often we spread some avocado on them or wrap them around some sardines or other filling. Sea vegetables are a seriously under rated source of nutrition. They are loaded with minerals that our modern diet tends to be very poor in. I keep some nori sheets in my diaper bag all the time. We also use a kelp seasoning mix in cooking and wakame from the Asian market in soups or sometimes I'll make a salad with it. I try to include sea vegetables in our diet as much as possible. I prefer not to rely on fruit to much. It's easy for a toddler to eat more fruit than anything else and I really try to keep the veggies and protein up and the fruit a bit more moderate. But dried fruit is a convenient and yummy snack. I keep some raisins and dried apricots in my diaper bag all the time. I also really like to make dried apples with cinnamon either as thin 'chips' (kind of like this) or I might cut them up more into thicker chunks and they turn out a bit more chewy. A great healthy snack and by making myself I can control the process and ingredients. Above are all snacks I can leave in my diaper bag for weeks and they are still good to go but some whole fruits and vegetables hold up really well even getting all jammed up in the bottom of my bag and will be fine if left for a couple days. Bananas, apples, clementines and avocados will all frequently be found in my bag. I'm always looking for new healthy ideas! 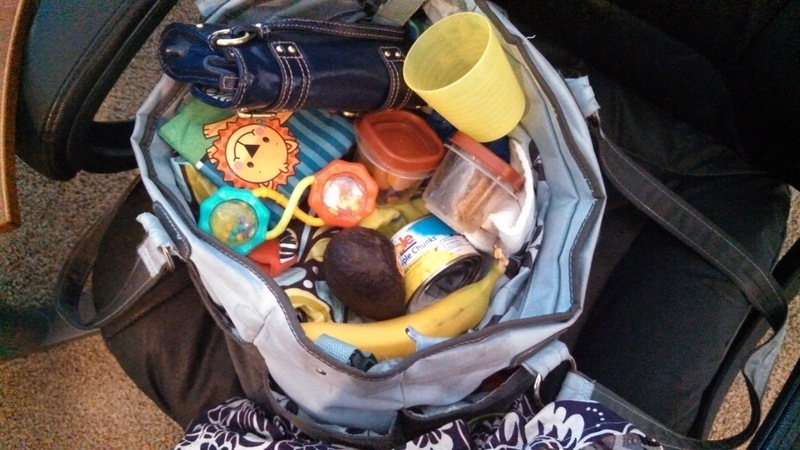 What do you feed your toddler on the go?